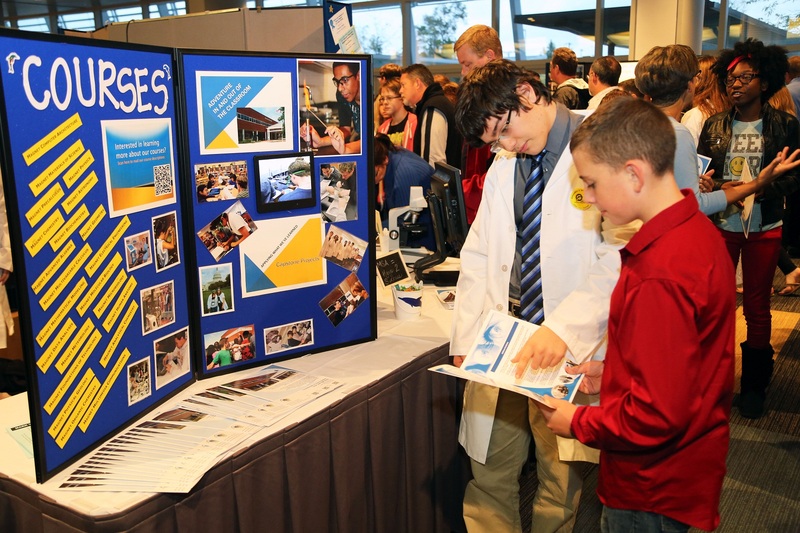 Hundreds of eighth-graders and their families descended upon the Virginia Beach Convention Center, Oct. 22, for the annual Academies and Advanced Academic Programs Night. The event allows the rising freshmen the opportunity to meet with students, teachers and program coordinators from each academy and advanced academic program. These include: The Global Studies and World Languages Academy at Tallwood High School, Health Sciences Academy at Bayside High School, International Baccalaureate Programs at Princess Anne High School, Legal Studies Academy at First Colonial High School, Mathematics and Science Academy at Ocean Lakes High School, Governor’s STEM & Technology Academy and the Visual and Performing Arts Academy at Salem High School. In addition, representatives from the Advanced Technology Center and Green Run Collegiate were on hand to answer questions about their programs. Rising freshmen got to talk with current academy students about their experiences in school at the annual Academies and Advanced Academic Program Night. Academy and advanced academic program applications are available at middle and high school guidance departments as well as vbschools.com. Completed applications are due to students’ guidance offices by Monday, Feb. 2, 2015. For more information, contact any middle or high school guidance office or the Office of Secondary Teaching and Learning at 757-263-1446.